In parallel of taking photos, I organize workshops with the association “Dialogues en photographie”. These allow me, on the one hand, to share my love for photography and, on the other hand, to enrich my eyes by seeing uninhibited creation of various publics. A workshop of the association “Dialogues en photographie” - even if it can take different forms - offers to one or more artists a residence to transmit to a small group of people all the stages of the photographic creation – in film or digital. The last workshop, held in October 2017, allowed 13 young people between the ages of 10 and 14, living on the Minguettes Plateau in Vénissieux to make a book called "Allées 11-21". All the projects are available on the website of the association. 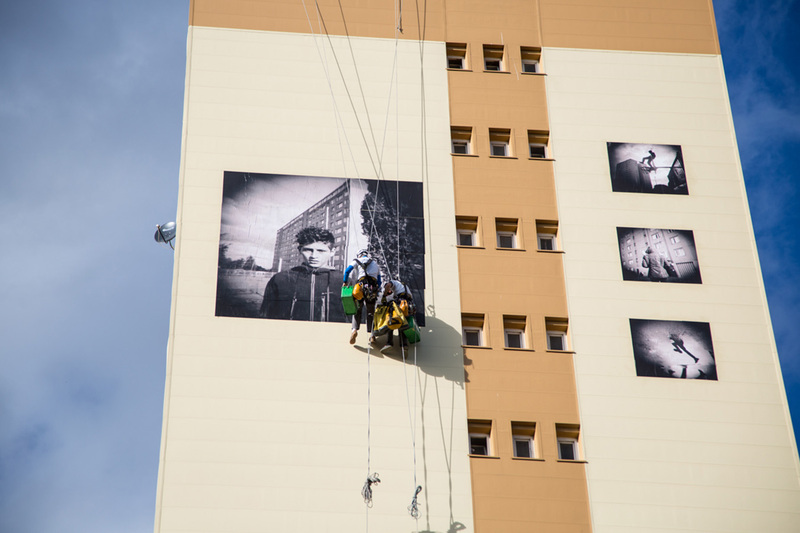 Photo from the exhibition “Between the towers” on the gable of a tower.